Kites Nest is a luxury four bedroom Villa set in a coconut and mangrove site and very near the spectacular white sand beach. Lying between Colva and Benaulim each with excellent restaurants and shops. A short walk across the paddy fields you’ll find free loungers and delicious meals of south Indian and Portuguese sea food. Sleeping eight with four en-suite bedrooms, a family room with TV, a large hall and a fully equipped kitchen. The birdsong , particularly at night, is wonderful. We have AC in one and fans in all rooms. The house is designed to allow the sea breeze to pass through. Our Housemaid is in daily and we can arrange to have you collected from the airport nearby. There is golf and fishing available. Cycles or scooters can be hired locally. Our driver will be happy to take you trips to see the many sights such as the animal wildlife, Old Goa, Temples, night markets and historic buildings. The stunning sunsets are unforgettable especially beach side with a cocktail in hand. Top things to do or see in Goa: South Goa is a beach-lover's paradise with its palm fringed, long white sandy beaches with safe bathing. The many scenic views are a treat for the eyes. Water sports are available locally along with river cruises for bird-watching or fishing. A railway station and airport are close, both with good national links. Hiring transport is easy but the Tuktuks or taxis are themselves very cheap. Whether eating in one of the many beach shacks or any one of the excellent restaurants it is a gourmet’s delight. There is a wealth of seafood, currys or something from a large range available, all at very affordable prices. Old Portuguese homes, Forts, Wildlife Sancturies, Spice gardens, Dolphin trips, Temples or old Churches are all here and a little further to North Goa there is the night market and all night rave parties with their electrifying experiences. After that try an Ayurvedic from one of the many therapy centres. Your holiday will be full of unforgettable memories and the wish to return. Climate of Goa: The best time to visit Goa is between November and March when the climate is extremely pleasant with temperatures mostly between 29°C – 33°C during the days. After this time the weather gets warmer but with the on-shore breezes is usually comfortable. As a rule the Monsoon arrive in early June and remains pretty intense for a couple of months. It then is intermitant with lovely sunny weather before returning for a final burst in September or October. The monsoon limits your options for a Goan beach holiday unless one enjoys the change it brings such as the re-greening of the countryside and the spectacular growth and flowers on display. The high season is December and January. All tiled with hot and cold water. WC, Shower and wash-basin. Full details are available on arrival or will be sent to you before you go. We thoroughly enjoy our time in Goa and wish you to do the same. We will ensure your holiday is as stress free as it should be and give any advise you wish. The property is tucked back from the main road and a fair distance from the beach if you don't like walking. We rented a scooter so we had no issues from choosing between any of the magnificent beaches on offer. Colva which is the main town has a very busy beach with many shacks offering good food and drink. We chose Sernabitem beach which is much quiter but excellent facilities none the less. I can highly recommend Cecilia's beach shack. The food is amazing and the owners friendly and accomodating. Further afield Bernaulim is a smaller but busier town which is highly poular with Russian tourists. I can highly recommend the magnificent Garden Restaurant in Colva for a quality dining experience at reasonable prices. You may however need to book as it is very popular. To be honest though, the choices are many, from Kareoke bars, pizza places, pure veg Indian restaurants to multi cuisine outlets. We had a bad experience in one of the restuarants at the beach in Colva called 49'ers early on when finding our feet, but that could just have been unlucky. Don't expect good coffee. You have to be clear how you want your it made. Get out and see the waterfalls, spice farms and elephant experience, visit old Goa, embrace the culture. It truly is wonderful. Yo can book at many places in Colva, however the Meeting Place is very reliable. Finally the house. It is huge. Well maintained, clean and suprisingly cool. All facilities are available, cooking, washing, tea/coffee, fridge and a very good water purifier. The house has a couple [living in rooms at the back of garage] looking after the gardens and will clean and wash but it will cost some money. If I am being honest we thought we would get a better cleaning service, but in week 2 they only changed beds once and cleaned once. They were good at arranging bikes or taxis. I stayed here with 4 friends after a charity event travelling across India and it was a very welcome conclusion to the end of an adventure. Great location, first impression was that it wasn't that close to the beach but once used to it, only a 10-15min pleasant walk. The house was spacious, well-equiped and maintained and had everything to make it a relaxing time. the house keeper, Chandra and her husband were great and looked after everything very well without being intrusive. 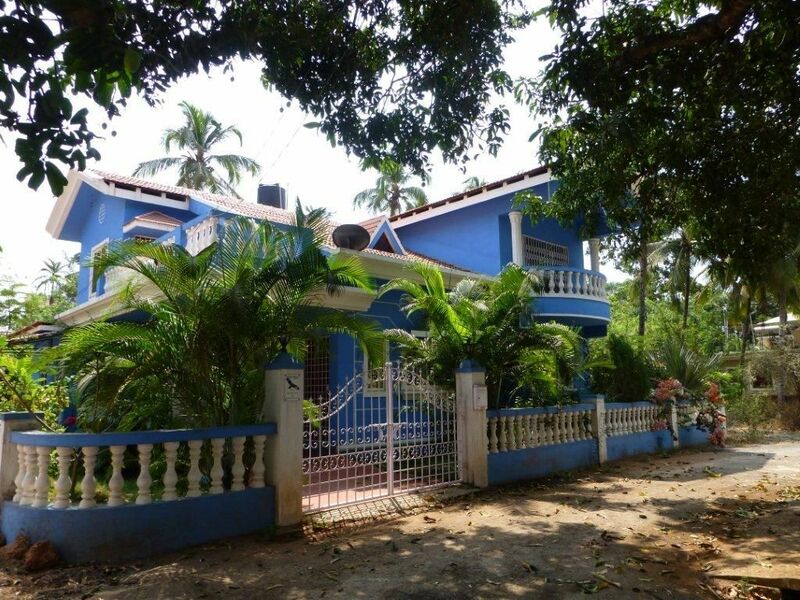 First let me say that the house, and our stay in Goa far exceeded all of our expectations. Location: The house is within walking distance to everything you need, and Alex the driver was more than helpful when it came to planning day trips to things like markets, spice farms, different beaches etc. We went to several beaches, and our little home base in Colva was the best, most chilled out in our opinion. House: The house is gorgeous, clean, and surprisingly cool. We didn't ever once want for AC because the house is set up in such a way with the ceiling fans that there was always a nice breeze. Also, I didn't need to use the mosquito net I bought. All of the windows have screens, and if you're smart enough to keep the doors shut at night you should have no problems. We were so happy we chose this route vs. staying in a resort because we actually felt we had a little home to come back to, and were all much more comfortable and relaxed. William has a great little " guide to Goa/ the area" on where to buy food, which shacks to go to, places of interest and just general tips for our stay. It was SO helpful and accurate. I would stay here again in a heart beat, and would definitely recommend the Kites nest villa to anyone who's thinking about going to Goa. Kites Nest is a luxury four bedroom Villa set in a coconut and mango grove and very near the spectacular white sand beach. Lying between Colva and Benaulim each with excellent restaurants and shops. A short walk across the paddy fields you’ll find free loungers and delicious meals of south Indian and Portuguese sea food. Sleeping eight with four en-suite bedrooms, a family room with TV, a large hall and a fully equipped kitchen. The birdsong , particularly at night , is wonderful. We have A/C in one bedroom and fans in all rooms. The house is designed to allow the sea breeze to pass through. Our Houseboy is in daily and we can arrange to have you collected from the airport nearby. There is golf and fishing available. Cycles or scooters can be hired locally. Our driver will be happy to take you trips to see the many sights such as the animal wildlife, Old Goa, temples, night markets and historic buildings. The stunning sunsets are unforgettable especially beach side with a cocktail in hand. Golf: Golf is available at the two largest hotels 5 and 15 km distance. Goa is not really a golf destination.